December has gone by so quickly — even more so than the rest of the year — and I can’t believe it’s Christmas in two days! 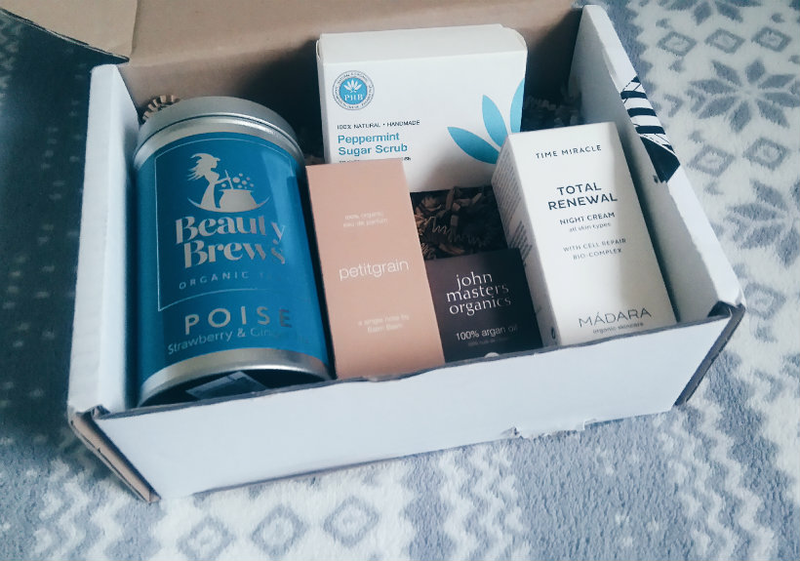 It felt like Christmas had come early when this month’s LoveLula Beauty Box arrived at my house. There’s a sugar scrub for the shower from PHB Ethical Beauty, fancy skincare from Madara, and even a little bottle of oil from John Masters Organics, who make my favourite hair treatment (Rose & Apricot Hair Milk). Unfortunately I’m allergic to strawberries, so I’ll be passing this on to a tea-loving relative! But it smells delicious and I’m quite gutted I won’t be able to try it. Poise is rooibos-based and contains ginger, apple, cinnamon, raspberry leaves, and strawberry. It promises to be refreshing despite being caffeine-free. I was so excited to see this in my box — I’m obsessed with PHB at the moment! First impressions? There’s just the right amount of peppermint scent in there, while the sugar granules themselves are nice and scrubby. The cocoa butter leaves your skin feeling extra smooth, but I’m a bit concerned this might run out quickly. This was the product I was most excited about, simply because I’d never even heard of petitgrain before! A single note fragrance, Petitgrain has a woody, citrusy smell that I’d say was unisex, leaning towards the more masculine end of the spectrum. And I love it. I always get nervous putting oil on my hair (it’s so flippin fine) but I used a little bit of this on the ends and they just looked healthy and shiny, so I think a subtle approach is key. The bottle is tiny but I only need to use a drop or so each time (the pipette is so useful) so I’m sure it’ll last me a good while. I’ve only patch-tested this so far because I went to London on Tuesday and my skin has flared up in protest, so any new skincare products are a no-go for now. The magic ingredient is something called northern birch juice, which is said to rejuvenate the skin. It feels quite light at first but as you rub it into the skin the texture becomes more balmy; it’s really quite luxurious. I’m going to pass this on to Mumma Toasty and see what her thoughts are, since she’s a bigger fan of rich creams than I am. Has anything in this month’s box caught your eye? Let me know in the comments!